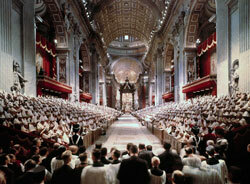 In four sessions from 1962 to 1965, the bishops of the world--more than 2,000 of them--convened in Rome for the Second Vatican Council. Sixteen documents on a range of topics were produced. Learn more about the council and its documents below. What were the 16 documents of the Council? Who were the leaders and influential voices of the Council?